Nivin Pauly is the star of the season. He hails from a small town named Aluva in Ernakulam district of Kerala and was born on 11th October 1984. Nivin belongs to a middle class family and was like you and me just before he came into the field of acting. His father was a mechanic in Aarau, Switzerland and his mother a nurse in a Swiss Hospital. Nivin completed his graduation in Electronics and Communication Engineering from Federal Institute of Science And Technology, Angamally in the year 2006. After his studies, he was employed at the renowned company, Infosys in Bangalore. 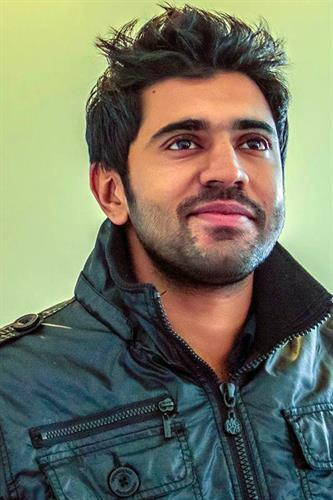 Nivin is married to Rinna Joy on 28 August 2010 at St. Dominic Syro-Malabar Church in Aluva, Ernakulam and the couple is blessed with a son named Daveed Pauly whom they fondly call Dhadha. The actor says that his son gets totally excited when he sees his dad on screen even though he is too young to understand about movies. Nivin had a love affair during his college days. He describes this affair as the love between a back bencher and a class topper. Even though Nivin is not clear about the quality in him which attracted Rinna, the class topper; he adds that it is easy to balance a relationship if both are two extremes. On the other hand Nivin was attracted towards the understanding nature of Rinna and of course his decision was a wise one. Nivin Pauly adds that Rinna was his biggest support during his struggles in life. She was the one who gave him strength to rise like a phoenix bird. Even now during his busy schedules at work, Rinna is supportive and is mature enough to understand the nature of his work. The star says that his wife is his best friend. Nivin Pauly had a passion towards acting but his family background was not favorable for it. He who was an engineer by profession, quit his job in Bangalore following his dad's death. Then for about two yeas he was unemployed. During these days Rinna used to motivate him and encourage him to follow his passion. She has never complained about the struggles they have to undergo. Their will power took them to the peak of success. Now Nivin Pauly is a star now especially among the youth. Many people say that is is the birth of his son, which was the major turning point in his life and all these success were after that incident. After he left his job at Infosys, Nivin Pauly was jobless and wanted to follow his passion. Thus he applied for the audition of the 2010 Malayalam flick 'Malarvaadi Arts Club'. However Nivin was not included in the twelve short listed candidates. But when one of the candidate dropped out, Nivin was given a second chance and was selected for the lead role in this film. Malarvadi Arts Club was directed by Vineeth Sreenivasan under the banner of Graand Production. The producer of this film was renowned Malayalam actor Dileep. Nivin Pauly gave life to the character 'Prakashan' in this film. He tried his best to make his character perfect and was cent percent successful in it. The film was declared as a super hit at the box office. After the click of his debut film, Nivin Pauly was seen in few other Malayalam films such as The Metro and Sevenes. However these two films where not a great success. The actually break in his career life was through the 2012 film 'Thattathin Marayathu', written and directed by Vineeth Sreenivasan under the banner of Lumiere Film Company. The film with romantic touch was the hit of the year. Nivin Pauly and Isha Talwar appeared in male and female lead roles respectively. The story of the film is about the successful love story of a Hindu guy and a Muslim girl. Nivin appears as the Hindu Nair caste guy named Vinod. Isha Talwar gives life to the character Aisha. Vinod who is madly in love with Aisha, will follow her and suffers a lot to see her. Finally he will win the race and get hold of her arms. The film became a super hit and it bought lot of fame and popularity to the upcoming actor. Suddenly Nivin's fan circle increased and he became a star. He was showered with positive reviews and responses for his performance as Vinod. Nivin Pauly had many offers one after the other. Bhoopadathil Illatha Oridam, Puthiya Theerangal, Chapters, Da Thadiya, My Fan Ramu, Neram, Arikil Oraal, Vikramadithyan, Mili, Ivide etc are some of his other films. 1983, Ohm Shanthi Oshaana, Bangalore Days, Oru Vadakkan Selfie, Premam etc are his popular film sin Malayalam. In the film 1983, directed by Abrid Shine Nivin gave life to the central character 'Rameshan'. It was a sports oriented film which the audience accepted wholeheartedly. Ohm Shanthi Oshaana is a wonderful flick directed by Jude Anthany Joseph. It says the love story between Pooja Mathew (Nazriya Nazim) and Giri (Nivin Pauly). This super hit film won three Kerala State Film Awards including Best Popular Film, Best Actress and Best Editor award. We could see Nivin as a pure village guy in the flick Bangalore Days, directed by Anjali Menon. In the 2015 film 'Oru Vadakkan Selfie', Nivin appears as Umesh an engineering student who has lot of supplies left. Umesh was lazy and bad at studies. He never helped his dad in his business or wanted to get a job of his own. The twist in his life occurred when a new family came to their neighborhood house. Manjima Mohan appears as the female lead in this film. The story of this movie proceeds with the missing of Daisy (Manjima). Again in the same year yet another super hit of Nivin Pauly was released. The film is titled 'Premam' and is directed by Alphonse Putharen. In this film too Nivin is portrayed as a college student who is bad at studies. The name of his character is 'George'. The film is a romantic movie and is one of the biggest grossing Malayalam films of all time. George fell in love with a school girl Mary and later on he came to know that she is in love with another guy with the same name. Further George was attracted towards his teacher 'Malar' (Sai Pallavi's role). It also did not work out and finally George fell in love with Celine (Madonna Sebastian), when he meets her in his cafe. George doesn't realize that Celine was the girl who used to accompany Mary to school. At last hey will get married to each other. Nivin's performance as George was outstanding. He received lots of applauds for his acting. 'Action Hero Biju', directed by Abrid Shine is one of the upcoming releases of Nivin Pauly. Nivin gives life to the character Biju Poulose in this film. This actor is sure to be seen in more and more movies for his acting talents are outstanding and simply superb.